A rattail is a hair style that is characterized by a long "tail"-like element of hair growing downward from the back of the head. The rattail usually hangs naturally; however, it can be braided, treated as a dread, permed, straightened, or poofed, curled with an iron. In some instances, an individual might choose to grow several tails as opposed to a single very long tail. The rattail saw a brief period of mainstream popularity during the late 1980s and early 1990s and has rapidly fallen out of vogue. However, it has recently seen renewed popularity. Some punks and rivetheads have been known to sport them also, although in a much more punky style, totally shaven head, except for a tuft of hair at the back, usually dyed in various luminous colours. It is a very popular hairstyle in Broome (Australia) and New Zealand, especially among boys, and is sometimes combined with shaven sides, a soft faux-hawk. Former junior welterweight boxing champion Kostya Tszyu sported a rather famous rattail throughout his career. In Disney's 2002 animated feature Treasure Planet, Jim Hawkins sports a rattail throughout the movie until the end. In the 2016 film American Honey, Shia LaBeouf's rattail garnered critical praise. In the 2017 film Wonder, August "Auggie" Pullman has a rattail during the beginning of the movie, until he cuts it after he gets made fun of it. 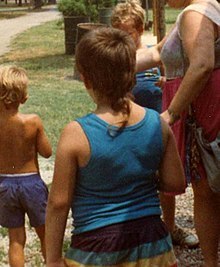 Wikimedia Commons has media related to Rattail haircut. ^ "Rat Tail Hairstyle". Retrieved February 15, 2010. ^ "Is the rat-tail, the worst men's hairstyle ever, making a comeback?". ^ "Shane Mosley & Kostya Tszyu: Boxing's Smiling Assassins". Retrieved February 15, 2010. ^ "Oh, Rihanna! Singer Debuts New Rat Tail Mullet". ^ "In Praise of Shia LaBeouf's American Honey Rattail". 30 September 2016. ^ Merry, Stephanie. "Review: 'Wonder' is the cry-fest you expect, but it's also complex, funny and probing". The Spokesman-Review. Washington Post. Retrieved 24 November 2017.